Introduce the new material to the child. Show the child the circles and tell the child that we will put these circles next to the answers of the questions written on the black arrows. First arrow will ask us for “what or who did the action”. The second arrow will ask for the object. Do a few examples with the child as in Simple Sentences. 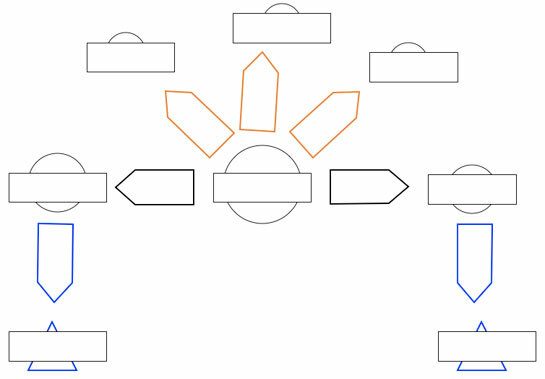 Same as Presentation 1 - As before but introduce the orange arrows and circles. 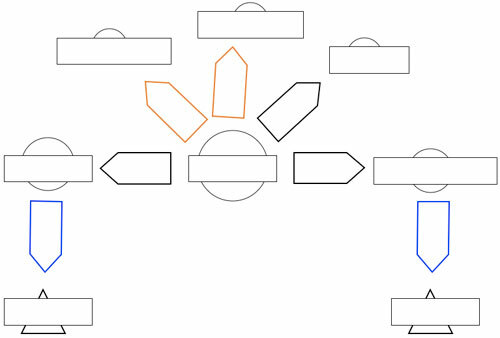 Same as Presentation 2 – As before but introduce the orange arrows and circles. Same as in Presentation 3- As before but introduce the blue arrows and triangles. Same as Presentation 4 –As before but discuss how because “our dog” and “Blacky” are the same thing, we can change their position without a problem. Explain to the child that when we can do this, we replace the blue triangle with a black triangle to show that it has a relation to “who is it that?” or “what is it that? symbol. To be able to analyze the sentence and to recognize the structure of sentences.